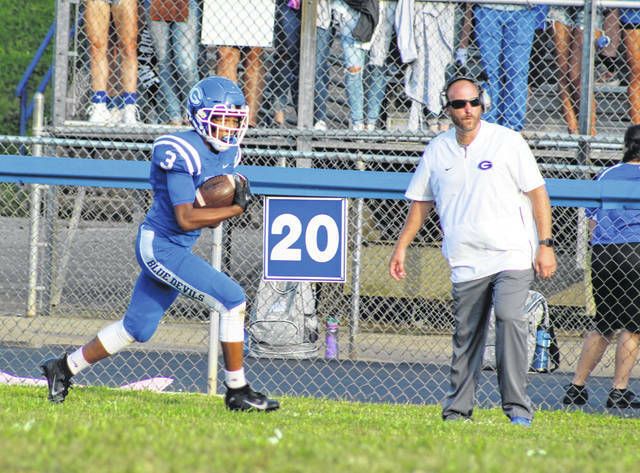 Gallia Academy sophomore James Armstrong (3) returns a kickoff in front of head coach Alex Penrod, right, during the first half of a Week 2 football contest against River Valley at Memorial Field in Gallipolis, Ohio. 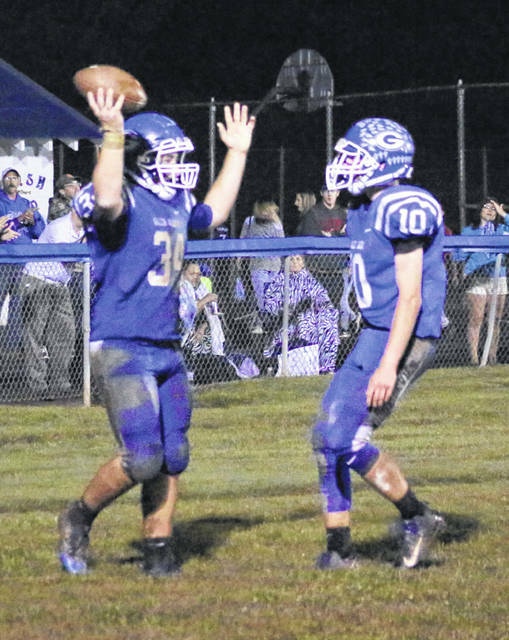 Gallia Academy junior Cade Roberts (34) celebrates a touchdown with teammate Cory Call (10) during the second half of a Week 6 football game against Fairland at Memorial Field in Gallipolis, Ohio. To the victors goes the spoils. In winning its first-ever Ohio Valley Conference championship in football, Gallia Academy ended up leading the way in postseason honors as nine Blue Devils garnered all-league selections on the 2018 OVC football team — as voted on by the coaches within the division. GAHS had eight total players represented on the squad, with a half-dozen of those coming away with first team accolades. Second-year Gallia Academy frontman Alex Penrod was also chosen as the coach of the year. Seniors Justin McClelland and Lane Pullins both repeated as first team selections and were joined by classmates Cory Call and Jacob Campbell, junior Cade Roberts and sophomore James Armstrong. McClelland — a three-time All-OVC recipient — completed 83-of-136 passes for 1,158 yards and 10 touchdowns to go along with three interceptions. McClelland also ran 119 times for 717 yards and eight scores. Pullins rushed for 792 yards and 12 scores on 133 carries and also averaged 34 yards per punt on 21 attempts. Campbell made 82 tackles, including 15 for loss, and forced a pair of fumbles at linebacker. Campbell also ran for 630 yards and 18 touchdowns on 105 carries. Call hauled in 24 passes for 345 yards and four scores. Roberts made 72 tackles, including six for loss, and had two fumble recoveries at linebacker. Roberts also caught 21 passes for 271 yards and two scores. Senior Trentin Waller and sophomore Riley Starnes were each chosen to the honorable mention squad on behalf of the Blue Devils. Waller made 68 tackles, including six for loss, and recovered three fumbles while forcing another. Starnes was the lone interior lineman selected for the Blue Devils. Ironton and Portsmouth both had seven selections after tying for second place, with Fairland and Chesapeake each landing five choices. Coal Grove, Rock Hill and South Point had four selection apiece on the all-league squad. The OVC does not select a player of the year. McClelland and Pullins were two of the nine repeat first team selections to the OVC football squad. Gage Salyers of Ironton, Talyn Parker and Coin Boehm of Portsmouth, Joel Lambiotte of Fairland, Austin Browning of Chesapeake, Nate Harmon of Coal Grove and Seth Nicely of South Point were also first teamers last fall. Seth Fosson of Ironton was a first team selection this year after earning honorable mention accolades in 2017. Ethan Duncan of Ironton and T.J. McGinnis of Rock Hill were repeat honorable mention choices this fall. GALLIA ACADEMY: James Armstrong, Cory Call, Jacob Campbell, Justin McClelland*, Lane Pullins*, Cade Roberts. IRONTON: Reid Carrico, Brady Rowe, Hunter Humphreys, Gage Salyers*, Seth Fosson#. PORTSMOUTH: Talyn Parker*, Coin Boehm*, Brian Carey-Knipp, Bryson Marrow, Ty Pendleton. FAIRLAND: Joel Lambiotte*, Michael Stitt, Blaine Cremeans. CHESAPEAKE: Kamren Harless, Dakota Hess, Austin Browning*. COAL GROVE: Aaron Music, Nate Harmon*. ROCK HILL: Logan Hankins, Triston Delong. SOUTH POINT: Joel Morrison, Seth Nicely*. GALLIA ACADEMY: Riley Starnes, Trentin Waller. IRONTON: Ethan Duncan#, Brycen Thomas. PORTSMOUTH: Eric Purdy, Ben Lester. FAIRLAND: Reilly Sowards, Gavin Hunt. CHESAPEAKE: Dillon Lunsford, Will Todd. COAL GROVE: Kyle Sites, Austin Stapleton. ROCK HILL: T.J. McGinnis#, Brayden Friend. SOUTH POINT: Brody Blackwell, Kameron Hardy.